I am currently in Spain enjoying tapas and sangria so I asked my friend Jeremiah Russel to sit in for me and talk about something that we are – well, not necessarily in agreement on. I read one of Jeremiah’s posts on shipping container architecture and thought that maybe I should give him my forum for a day and see what other people are thinking about these structures. You can find Jeremiah at the helm of his own blog on most days and if you want to follow him on twitter (I do) knock yourself out. Do me a favor and leave him a comment in the section below – let’s see if we can’t sort some public opinions out on using shipping containers as precursory building shells. 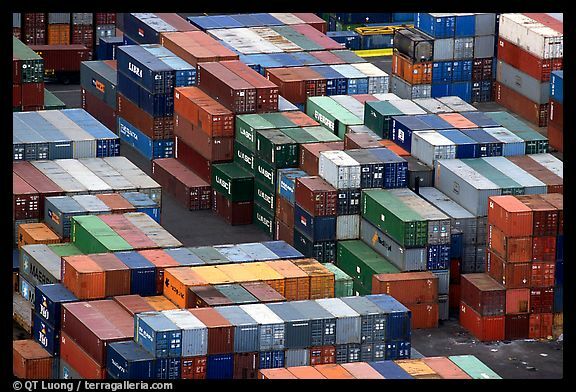 How do we design with shipping containers to save cost without sacrificing space, function and style? This may seem like a tall order, but I assure you it isn’t. But let’s start with a little background on shipping containers: shipping containers (or ISBU’s – Intermodal Steel Building Units) are basically modular rectangular steel cubes. The most common dimensions are 8′-0″W x 8′-0″H x 20′-0″L. Longer lengths are available at 40′-0″, as well as what is called a High Cube container at 9′-6″H (length and width are static). I believe there are also 5′ and 10′ extensions, but that’s not important. Being modular, containers can be easily moved, stacked and mechanically connected in great numbers. They are also EVERYWHERE. Just go to your local shipping port and stare googly eyed at the massive sea of containers stretching out before you, if you don’t believe me. OK, so we’ve got these cubes, these building blocks. What do we do with them? 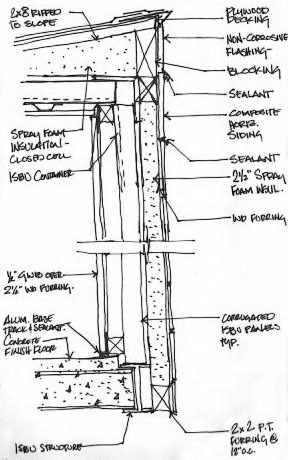 First, like any good architect will do, you want to lay out your building program (duh, I know) – how many bedrooms, how many bathrooms, a modern or traditional kitchen, indoor/outdoor flex spaces…in other words, how is your home going to work. Next you begin laying out your floor plan. The big difference here, though, is you have set dimensions that you have to work with instead of being able to just push and pull space wherever you damn well please. More careful thought has to be put into how the various programmatic spaces will work together within the home. Obviously you could just take a dozen or so containers, smash em all together and make your typical “McMansion”….but that’s not really what we’re after here. The trick is to use as few containers as possible while still providing adequate space and function in the home. This can be a real challenge for many architects and designers who are used to designing homes and spaces that, quite frankly, are much larger than required for the average user. For example, a single 20′ container can be designed as a single unit, or pod, to include a single bedroom and bathroom while another 20′ container can be designed as the public portion of the home. By putting these two containers together, you get a 1 bedroom, 1 bath home that can be built quickly and, depending on the quality of finishes, very afford-ably (think IKEA, Home Depot and Target). This is even the type of home that, given some basic construction knowledge and the help of a few close friends, can be built by the homeowner, saving thousands in labor costs. Using the same design above, but instead using 40′ containers, we have an example that perhaps gets closer to what would be considered a “real home” that, as my wife puts it, “normal people would want to live in”: a home with 2 bedrooms, 2 bathrooms and all the “bells and whistles”, so to speak, but still in only 640 sf (conditioned). Looking at the above model you can even see the opportunities for sustainable technologies that can easily be added to reduce or remove this home’s dependence on fossil fuel energy. Solar panels can easily be incorporated into the gable roof, rain water can be collected and stored underneath, passive heating and cooling can be used by carefully placed openings (depending on location). Because of the small square footage, less energy will be required within the space anyway, so your investment in sustainable tech will be less as well. 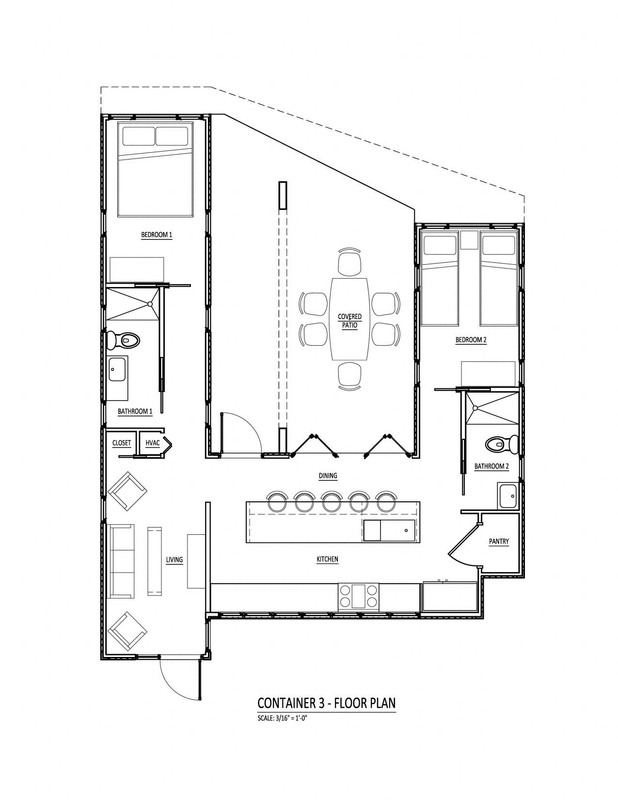 I know, you’re thinking “640 sf is not enough space to house 2 bedrooms and 2 baths and still have comfortable living spaces.” Well, I say to you, think back to your first apartment. My first apartment was just over 900 sf and it was HUGE! 2 bedrooms, 2 bathrooms, living, dining, kitchen and a deck. Way more space than I needed and I’m sure with a little finesse I could have added a third bedroom in there easily. The moral of our little tale here is, containers allow architects and designers to think differently about how space is used and organized for optimum use in minimal square footage. We still have to abide by our state and federal building codes and accessibility requirements, this goes without saying, but think about the last house you designed – where could you have saved some square footage without sacrificing function, design and style? I’m betting you’ll be surprised if you think about it critically for a moment. While I was writing this article a friend of mine sent me this small article that offers photos of some container projects from all over the world, both commercial and residential. These projects are real, they’ve been built and they are successful, i.e. people WANT to live in them. Used shipping containers provide an affordable building block for any type of construction project, but especially for single family and multifamily homes because they can be purchased inexpensively, assembled quickly and, depending on how you choose to insulate and finish, constructed into a finished building in less time with less expense than conventional construction.